While the run of clear evenings continues I am able to add to my galaxy collection. 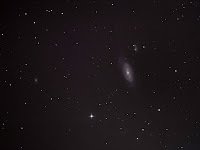 Last night I decided to try for M90. The guiding continues to pre-occupy me as it is the key element in getting the best quality images. Without having changed anything the guider performed noticeably better last night than it had done the previous evening so understanding why would be helpful. I'm wondering just how much the quality of the seeing affects the guiding software....I think the atmospheric steadiness may have been better last night. In this image the galaxy on the left is NGC 4584 and the one just upper right of M90 is IC 3583. Details 12x 7 minute exposures @iso800 with CLS in DSS & CS2.